Have we mentioned that there’s a new Toyota Supra out on this site yet? I don’t think so, but I think maybe we should have some content about the car, right? 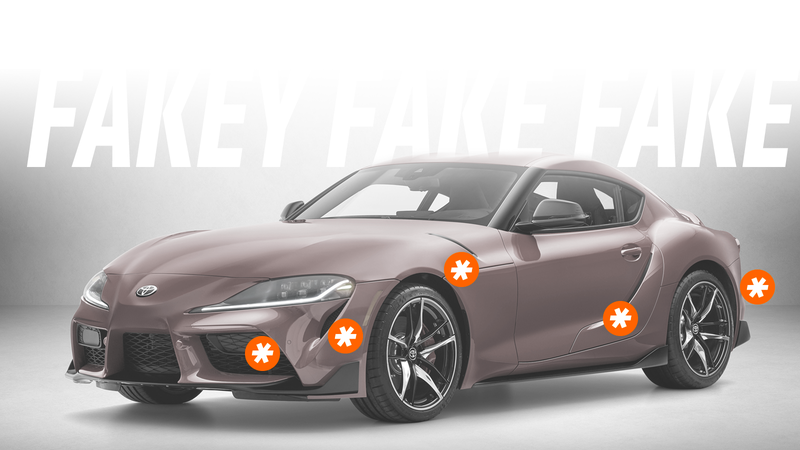 With that in mind, I’d like to inform you that our crack Jalopnik team has assessed the new Supra and located every fake vent or air intake on the car. Here’s your guide to all the lying vents on the 2020 Supra. It’s worth mentioning that fake vents are by no means unique to the Supra; they’re a near-constant now in the world of auto design, a cruel blight deceiving innocent humans as to where on a car air is either taken in or expelled. It is only with full transparency and honest can we combat the plague of false ventification. This is possibly the most dramatic of all the fake venting on the car, since it looks like some real effort was expended to add this particular false vent. There appears to be an entire extra added-on panel to the door skin to house this vent. The panel on the door also forms the leading edge of the rear fender line, so while this panel would likely still be there even if the vent was eliminated. Conceptually, it’s sort of an odd vent, since the shape and location look sort of like a cooling vent you’d have on a mid-engined car, which the Supra is clearly not. Perhaps it could be a brake-cooling duct? I mean, if it was real, which it isn’t. It’s very tall, very narrow, and very fake. The Supra’s hood has these interesting comma-shaped vents in the hood that help define the trailing edge of the front fender bulge and do pretty much nothing else, functionally. They look like the sort of vents that would be used as heat exhaust outlets to help keep the engine bay cool, but they’re just solid rubber. I’m sure eventually someone who upgrades a Supra’s engine may decide to punch them out and make them functional, but as of now, they’re not. Right below the headlights are a pair of teardrop-shaped, diamond-pattern intakes that look like they’d be in the ideal position to funnel air to cool brakes. Except they don’t, because they’re fake. In some ways, these may be the most excusable fake vents, since they appear to be panels that are covering or housing some sort of equipment. The one on the left is actually a fake grille with an untextured panel that’s housing...something. It’s some sort of sensor—perhaps a radar transceiver for dynamic cruise? The other side has an inset area that appears removable; at first I thought it could be for fog lamp housing, but then you’d need a pair, right? These fake vents are becoming sort of a Toyota signature design element, as they’re also on the Camry and likely to spread to other Toyotas, like some kind of false-vent virus. I suppose functionally they could be air exhaust outlets for brake cooling, but, of course, they’re not. Maybe you could argue they’re not really fake vents as much as vent-like design elements? That seems semantic, though, and I’m not sure it’s an argument I really want to have. That’s a pretty big number, but I don’t think all that unusual in this modern falsely-vented era. But is there a car with more?